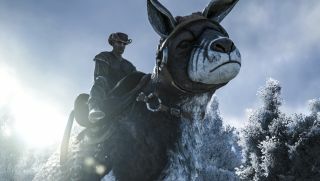 Studio Wildcard is dropping the New Year's Eve Ball in Ark: Survival Evolved, and when it touches down at midnight EST, everyone at the party will be given a “fantastic surprise.” But the real fun is the addition of a new creature called the Procoptodon, which is essentially a huge, prehistoric kangaroo with a gun in its pocket and look of perpetual annoyance on its face. The largest of the real Procoptodon, according to Wikipedia, was P. goliah, which stood well over six feet tell and could weigh more than 500 pounds. The Ark version is even larger, capable of rapidly covering great heights and distances while carrying two passengers, one of whom—the one in the pouch, naturally—can make full use of all weapons while on the move. It's basically a drive-by-capable mega-marsupial, which as videogame ideas go isn't the worst I've ever heard. The update also adds a new Tribe Alliances option to the game, enabling multiple tribes to officially band together to take on larger, more powerful outfits. Full details on the update (although between the dropping ball and the dino-roo, we've pretty much covered it all) are available on Steam. Speaking of which, Ark: Survival Evolved is currently on sale for 40 percent off—that's $18/£14—as part of the Steam Winter Sale, which runs until January 4.